Whole, Term, or No Life Insurance? Which Option Is For You? 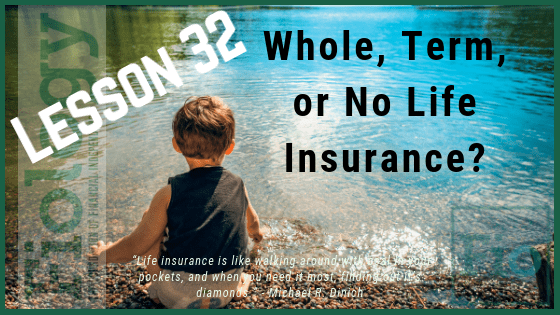 LESSON 32 : WHOLE, TERM, OR NO LIFE INSURANCE? Fiology thanks the FI community’s Life Insurance expert Michael Dinich of Your Money Geek for shaping this lesson. Life Insurance may seem an unlikely ally in the pursuit of Financial Independence, however adequate insurance plays a vital role in planning. In years past, workers relied on their employer for a pension as well as life and health insurance benefits. Today, workers are increasingly unlikely to be eligible for a pension and those seeking Financial Independence likely will not have accumulated enough time with their employer to carry many traditional benefits into their post-W-2 years. Adequate life insurance protects families seeking financial independence until they have sufficient assets saved to to self-insure against premature death. Life insurance is, at the end of the day, a precaution – a rainy day preparedness item. Every precaution can be thought of a “waste” of money. That is, of course until it is needed. The mistake commonly made is viewing insurance solely through an economic lense. Life Insurance serves more than an economic role. Having it can provide peace of mind. In pursuing financial independence, the goal should be to optimize dollars that are spent and those that are saved. Being smart about the purchase of life insurance can save hundreds and possibly thousands of dollars a year. Take Action: Using the Life Insurance Needs Calculator at lifehappens.org, determine, based on your specific circumstances, the type and amount of life insurance you believe will support your FI goals. If you determine that life insurance should be a part of your plan, account for this expense in your FI calculations.